Talcum powder may catch a man, but it takes baking powder to hold him. Cooking shows were a natural progression to try to capture the homemaker market, many of whom were at home all day taking care of the kids and the house. It was a natural progression to create female specific programming and cooking was just one piece of the programming pie. Truthfully, it is difficult to find information about cooking shows. Some of the shows are grouped under homemaking shows. 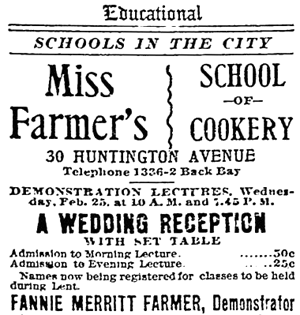 Homemaking shows included a cooking element along with the housekeeping tips, child-rearing, and even laundry tips. There was no roadmap for how to program radio in the 1920s and 1930s. Creating show content was hit and miss. By far the most popular type of program was the soap opera with Proctor & Gamble leading the way. 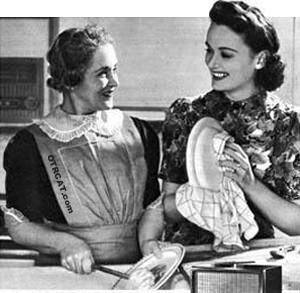 Proctor & Gamble also lead the way in homemaking shows such as Sisters of the Skillet which aired two mornings each week as part of Mrs. Blake's Radio Column. Proctor & Gamble created Mrs. Blake's to showcase several brands and Sisters of the Skillet was sponsored by Crisco. 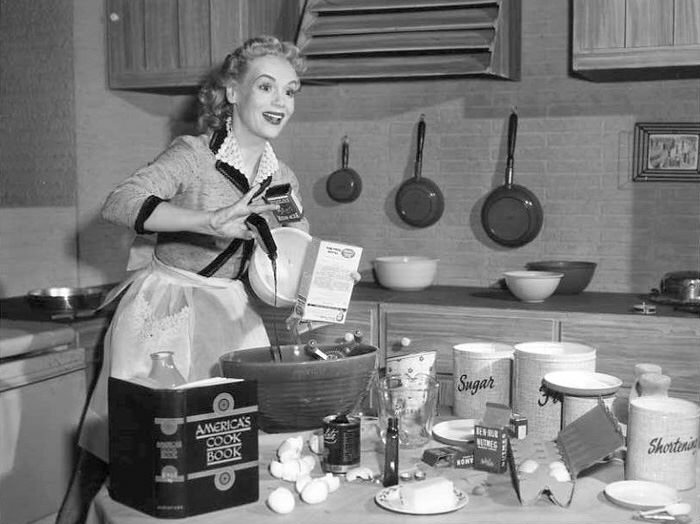 In the 1940s and 1950s, radio technology changed and talent changed but the basic content of homemaker shows stayed the same, housekeeping, child-rearing, and cooking. One of the earliest cooking shows was The Mystery Chef. This show featured recipes for cooking on a budget, which was very appropriate considering the radio show started in 1930 and ran until 1945. The Mystery Chef was John MacPherson of Scotland and Boston. MacPherson was not a professional chef. Instead he came to cooking to defend himself against the bland meals in his boarding house. The Mystery Chef started as a local show in Boston in 1930 and appeared on the NBC Red and Blue networks, CBS, and ABC. While his 10,000 recipe collection ran the gamutrich, rare, frugal,common, simple, complicatedhis frugal recipes during the depression were the most popular. The Mystery Chef's Own Cookbook was released in 1936 with simple recipes but, according to the chef, the most important ingredient was love. "You must go into the kitchen with love in your heart for what you are about to do, and for the people who will eat your cooking." Sponsored by PET Milk, The Mary Lee Taylor Program was the creation of Erma Perham Proetz. While Mary Lee Taylor was an accomplished chef, a nutritionist, and a home economist, Erma Perham Pretz was an advertising executive at the Gardner Advertising Company in St. Louis, Missouri who created her and was Mary's first voice. 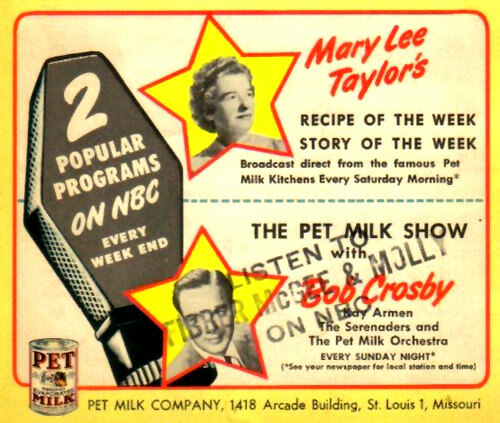 The Mary Lee Taylor Program was the longest running radio cooking show starting in November 1933 and ending in October 1954. The show began at 15 minutes at the height of the Depression. Her recipes were easy, economical, and, featured PET Milk, of course. Shows included housekeeping tips, meal plans, cookbook promotions, and presenting a PET milk recipe. One of the most enduring PET Milk recipes featured on the show was the popular Pumpkin Pie. In 1948, The program was expanded to 30 minutes and a new soap opera segment was added at the beginning of the show. The new segment was called The Story of the Week and followed the ups and downs of a young married couple, Jim and Sally Carter. After the soap opera, Mary came on to present her recipes and tips. Mary let listeners know that, for a PET Milk label, the company would send a recipe booklet. The Sperry Flour Company of San Francisco sponsored the Martha Meade Society Program. Martha Meade was the face of Sperry Flour Company and was created to promote the company. The 15-minute show was on the air in the early 1930s. Much like other cooking and homemaking shows, Martha Meade Society featured recipes using Sperry Flour, offered housekeeping tips, and more. Like other cooking shows sponsored by a food manufacturer, the company offered booklets featuring recipes using the company's flour. When you hear Betty Crocker, radio is probably the last thing on your mind but in 1924, the Washburn Crosby Milling Company presented the Betty Crocker Cooking School of the Air. It was an immediate hit and in 1925, the show expanded to 13 radio stations, each with their own Betty Crocker voice. The cooking school of the air was actually a cooking school. In the first year, 238 "graduates" sent in reports for grading with an age range from 16 to 82. In 1927, the Betty Crocker Cooking School of the Air debuted on the new NBC network. On the air for 24 years, the school had over 1 million people enrolled. Before there was ever a red and white Betty Crocker Cookbook, there were recipe booklets listeners could request. 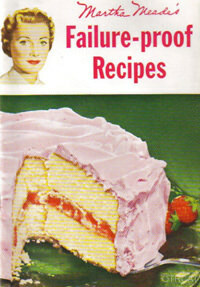 The recipes for the show and for the booklets were created by 21 home economists in the Home Service Department, the predecessor to the Betty Crocker Kitchens. Volume 1 of the collection contains cooking-centric episodes from different radio series like Fibber McGee and Molly, Burns and Allen, Life of Riley, and Cavalcade of America. Fibber tries to have his way in the kitchen cooking his signature recipe "Shrimps McGee." George Burns wins a blue ribbon at the county fair for his ladyfingers. Irma takes cooking lessons in a half baked scheme to catch a man. Also included in this collection is the Cavalcade of America episode about Frannie Farmer, the pioneer in the domestic science movement who introduced to America standardized cups and spoons. Her books so popular are still in print today! Cooking shows have had a place on the air waves from the very beginning. It is a testament to the popularity of presenting delicious food, simple food, or a frugal meal that cooking shows were popular over the radio. Be the first to comment on "Cooking in Old Time Radio"